A new study from North Carolina State University researchers in the US reports that light-weight composite metal foams (CMFs) could be significantly more effective at insulating against high heat than the conventional base metals and alloys they are made of. The finding means that CMFs could be used for storing and transporting nuclear material, hazardous materials, explosives and other heat-sensitive materials, as well as for space exploration. ‘The presence of air pockets inside CMF make it so effective at blocking heat, mainly because heat travels more slowly through air than through metal,’ said Afsaneh Rabiei, a professor of mechanical and aerospace engineering at NC State and corresponding author of a paper on the work. The composite metal foam consists of metallic hollow spheres – made of materials such as carbon steel, stainless steel or titanium – embedded in a metallic matrix made of steel, aluminum or metallic alloys. 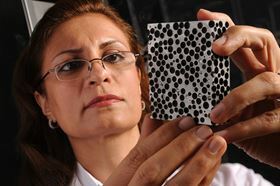 Afsaneh Rabiei examines a sample of composite metal foam. In one test, researchers exposed samples of 2.5 inch by 2.5 inch steel-steel CMF that were 0.75 inches thick to a fire with an average flame temperature of 800°C for a period of 30 minutes on one side, and monitored the material to see how long it would take for the heat to reach the opposite side of the sample. For a piece of bulk stainless steel with the same dimensions as the CMF sample, it took only four minutes to reach 800°C through the entire thickness of the sample. But it took eight minutes for the steel-steel CMF to reach the same temperature. The researchers also found that the composite metal foam made entirely of stainless steel expands 80% less than bulk stainless steel at 200°C, and the differential increases at higher temperatures. Moreover, the composite metal foam expands at a fairly constant rate when exposed to high heat – whereas conventional bulk metals and alloys such as stainless steel expand more rapidly as temperature increases. ‘Our findings suggest that CMF can offer extremely good thermal insulation, superior thermal stability, and excellent flame retardant performances as compared to commercially available materials such as stainless steel,’ Rabiei reported. The paper, Experimental and computational studies on the thermal behavior and fire retardant properties of composite metal foams, is published in the International Journal of Thermal Sciences. This story uses material from North Carolina State University, with editorial changes made by Materials Today. The views expressed in this article do not necessarily represent those of Elsevier. Solvay and Essex Furukawa Magnet Wire Europe (EFMWE) have won a prize from Magna Powertrain for their development of automotive magnet wires. Foam produced with 3D printing has better durability and long-term mechanical performance than conventional foam.